tags: Good or Evil?Go with evil.You can hit restart when you go to hell. A video game based on "The Mummy Returns"(2001) movie where you can play as Rick O'Conell or Imhothep to face the monstrous Scorpion King. 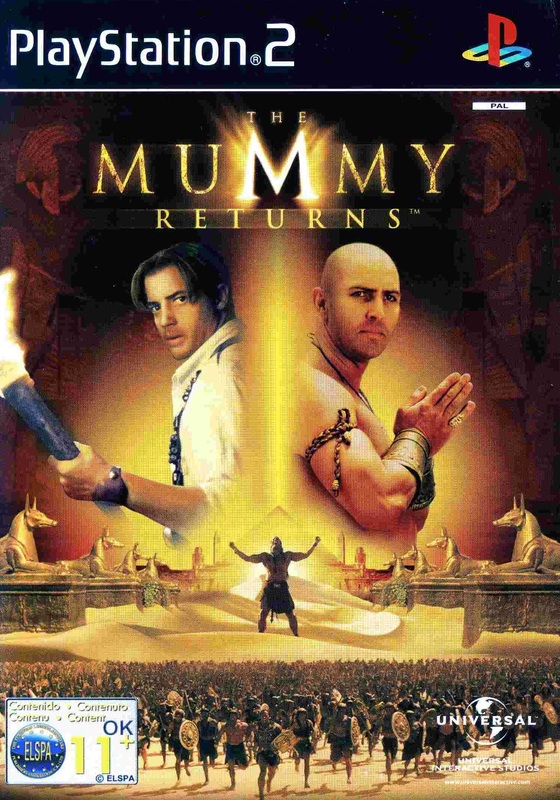 As a game, the Mummy Returns is just "ok". And the simple animation(no mouth movement during cut scenes), is a little irritating. But, as a video action figure "play set" for your PS2, it's fantastic!! You get to play with GI Joe sized "action figures" of either Rick' O'connell, or Imhotep. And, as an added bonus, the PS2 joins in with "action figures" of Evelyn, Ardeth Bay, Johnathan, Mila, Medji warriors, and red guard! The game play is simplistic. For kids this game may be a challenge, but for us adults who loved this fantastic movie and it's awesome original, this is a guilty pleasure that gives us a chance to play with a Mummy Returns action figure set! I must confess I´m deeply interested in ancient Egypt and so I have enjoyed "The Mummy" & "The Mummy returns" so much. While both are action movies, I enjoyed the setting and the story (plot), and having Brendan Fraser as the main star doesn´t hurt whatsoever. "The Mummy" (1999) was, to my mind, the greatest achievement- and challenge- in the Adventure-genre since "Indiana Jones and the Last Crusade". A few sequences in the movie "The Mummy Returns" are quite brilliant, including the fighting off the warrior-mummies in the double-decker bus in London turned single-decker, which to me was also one of the funniest sequences. Still, the special effects and splendor of the movie leave little time for character development. The movie is amazing to watch indeed, though I felt betrayed that the beloved characters of the movie where given so little time to actually show us even more about them and their personalities, It´s fast-paced, but just when you think it ought to slow down and show us a little more about those characters and their interactions, we´re pitifully off again to the next segment. Needless to say that the fight scene between Nefertiti and Anuck-su-mamen as seen in a flashback by their modern day selves is formidable. To a large extent, that whole scene helps bring the plot line together, but it comes too late and is too short to me. After watching that cool movie twice, I realized the plot had some flaws, which only a serious action-flick lover could overlook. First, if the mummy was defeated in the first movie by being made into a mortal, how was he able to be brought back as the "same" creature? How was Rick raised in an orphanage in Egypt but is an American complete with accent?. Further, If Evie was the reincarnation of an Egyptian princess, why didn´t she have the same visions in the first movie? For all this, if you can suspend belief and watch for special effects (like me), you will probably enjoy this movie much, otherwise you´ll probably be disappointed. Be that as it may, the performances are, all in all, fair compared to the previous movie. Rachel Weisz is amazing, although she does not deliver the same energetic performance as in the original, save for a few scenes. further, Brendan Fraser is also toned down a bit too much in this follow up as maybe it was intended to show the passage of time and age, but I still guess the spark of the original dimmed a bit. In short, such a good movie deserves favorable comments indeed.